A few years later a girlfriend ran the boat onto rocks. That is a story that I can only tell if I am heavily sedated. The Saab story is far happier so I will continue with that one. As a hobby I took up climate science, in which I published books and papers predicting solar-driven cooling. As a consequence of those efforts I met some of the good and the great, including Vaclav Klaus, then President of the Czech Republic. I was also invited to give a lecture on climate science in a US Senate hearing room in 2011. That led to a role with a Washington think tank and the publication of a book on geostrategic issues entitled Twilight of Abundance. That led in turn to an interest in defence issues. One of the biggest issues in defence is the fighter aircraft that the western world will rely upon. I am not the only analyst who finds the F-35 highly deficient. The question then is “What do we replace it with?” Happily there is a fighter aircraft available now that does not have any shortcomings at all – the Gripen E from Saab. The Gripen E has much the same capability as the Eurofighter Typhoon and the Dassault Rafale. They are all good aircraft but the Gripen E is half the price of the other two and costs a lot less to operate. I wrote about how good the Gripen E is in a book called Australia’s Defence published in 2015. Believe it or not, the Gripen E, if armed with the right missiles, is almost as good as the F-22 which would cost three times as much if you could get one. In late 2015, Saab sent two people to see me in Perth, Australia to discuss fighter aircraft design. One travelled from Linkoping and the other from Bangkok. They said, “We like your work Mr Archibald. You just made some small mistakes and we hope you don’t mind if we point them out.” The journey from Linkoping was 30 hours of flights and connections each way. I told the Saab man from Bangkok that I would write a book entitled American Gripen: The Solution to the F-35 Nightmare. That process started with an article of the same name published online in early 2016. That article was well received and republished in a number of languages. So I persevered and the book, American Gripen: The Solution to the F-35 Nightmare, is now available on Amazon. I have not been to Sweden yet but I have been to Norway a few times. In the 1990s, I used to visit friends who were stationed in Stavanger. A couple of years ago I was invited to a climate workshop on Svalbaard. I have an ongoing interest in things that affect the climate of the Scandinavian countries. My Saab convertible is a happy car and my whole Saab story is a happy story. 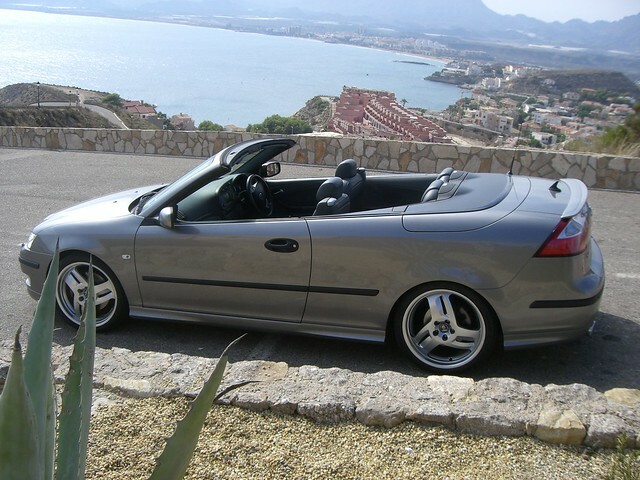 I often visit the SAABSUNITED web site and thought I would send you the attached photo of our SAAB taken during a recent driving holiday to Southern Spain. This SAAB has served us well over the years touring through Europe. As well as the Hirsch 19ins wheels seen in the photo, the car has also a Hirsch 252bhp power upgrade and Hirsch springs. This makes an ideal combination for touring on the continent and in particular through the Alps and Pyrenees.